Out of a possible 12 points between them, FC Porto and Zenit had only managed to get four points in their Champions League group prior to this match. Given that the home team would be playing the second match in front of their own crowd, a win was imperative. Still, the need wasn't as great as to merit the inclusion of star Juan Quintero in the starting line-up, with FC Porto coach Paulo choosing to go with Fernando, Herrera and Lucho instead, with Licá and Josué on the wings. Zenit, in turn, went with Danny, Arshavin and Hulk up front, with Shirokov ahead of Shatov and Fayzulin, Luciano Spalletti abandoning the team's usual 4x3x3 blueprint. In spite of the change in formation, Zenit still maintained their habitual cautious approach away from home - no longer arranged in a 4x1x4x1 while defending, but rather in two banks of four. However, the curiosity that enveloped this particular tactical clash was not to be sated, because FC Porto midfielder Hector Herrera found a way to get himself sent off after just 6 minutes. While the second booking resulted from a few steps taken forward while he was part of the wall, the play that led to the free kick (a foul committed by Herrera himself) spoke volumes of where each team's strengths and weaknesses lay. 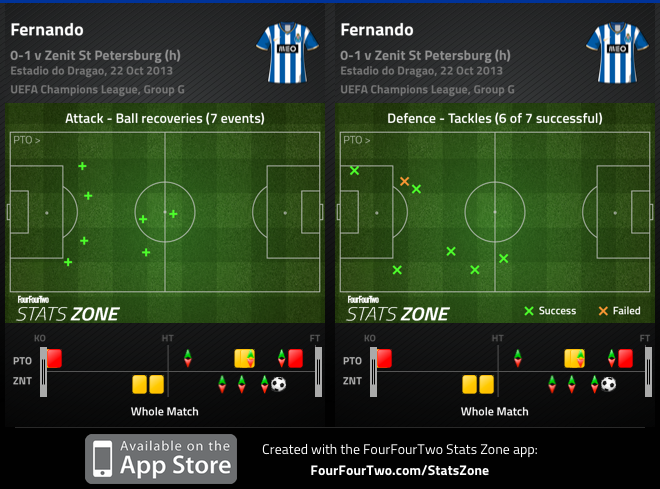 FC Porto had a corner it their favour, did not manage to get a shot on target - a simple transition led the ball to Hulk, who would end up blaze a trail right down FC Porto's middle with no one able to catch him except for Herrera (illegally). Even with a man up, Zenit did not look the least bit interested in exerting pressure higher up, opting to allow their opponents time on the ball and break quickly as soon as they recovered it. After Herrera's sending-off, Josué dropped back alongside Fernando, leaving the wing for Danilo, with Lucho remaining just off Jackson Martínez. In fact, it would be the captain hitting the woodwork on 19 minutes after Alex Sandro had drawn everyone's attentions to himself. 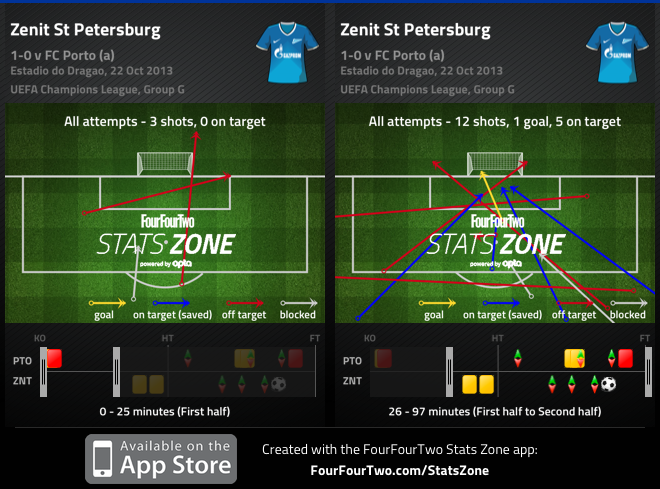 30 minutes into the match, FC Porto still had twice as many shots as Zenit (8/4). However, it was becoming increasingly clear that it would not be physically possible for FC Porto to keep playing their possession-based brand of football, and indeed the team started resorting more and more to a more direct approach as the match wore on, particularly because Hulk was starting to constitute a greater threat by being permanently stationed behind Alex Sandro, looking to drift inside toward his best (only) foot. As the teams went back to play the second half, the Dragons were now playing something that resembled a 4x2x1x2, with Lucho forming two triangles - one ahead of Fernando and Josué, and another one behind Jackson Martínez and Licá (subsequently Varela). As the home team started to tire out, the away team piled on the pressure, with FC Porto incapable of responding for most of the time (Varela's powerful shot against the woodwork notwithstanding). Former Real Madrid and Argentina holding midfielder Fernando Redondo used to say that playing alongside someone was like playing with one eye closed. Fernando would probably agree. With Josué somewhat lost in Herrera's role and trying to provide the necessary compensations on the left wing, it was up to the Brazilian to prove his mettle and show the inattentive European (as well as Luiz Felipe Scolari's) scouts just what he's capable of, sweeping everything in front of him. Yet, the Brazilian's efforts were not enough for FC Porto to get a draw - let alone the result they were looking for. The sub Kerzhakov came on 72' to replace Shirokov, taking his place in the centre and forcing Hulk out wide (despite the forward's best intentions, it is rather clear that the striker role is not one that allows him to excel, making him spend too much time with his back to goal). Five minutes from time, Kerzhakov ended up scoring from a well-placed header from Hulk's pin-point assist, thus putting a huge dent on FC Porto's hopes to qualify from their group. It remains to be seen what consequences - both physical and psychological - this result and effort will bring for next Sunday's match against Sporting.